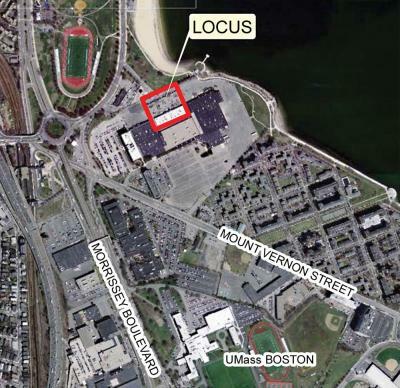 An aerial view of the Columbia Point area shows the property owned by the Boston Teachers Union in a red box. Image courtesy BTU/Tetra Tech, Inc.
Columbia Point – identified in January as the potential home of an elaborate, 140-acre Olympics Athletes Village if Boston wins its bid to host the 2024 Summer Games ­– has proved to be an increasingly complicated jigsaw puzzle for Olympics planners as existing stakeholders on the Point move ahead with plans to build out their properties. The village proposal faces a significant hurdle: Is there sufficient room on the peninsula to accommodate Olympic facilities without demolishing or relocating existing businesses? The planning process has been further complicated by delays in engaging key property owners and by conflicting accounts from the city and Boston 2024 officials about how the contours of the village might change. Key parcels that Boston 2024 officials would need to build out the athletes’ compound as outlined in their bid document have already been approved for other uses, with several large building projects already under way or else green-lighted to start this year. And while Boston 2024 organizers have sat down with some key landowners on the peninsula, they have not engaged with others, including the pivotal Boston Teachers Union, whose current headquarters building on Mt. Vernon Street sits squarely in the middle of the proposed village footprint. On Tuesday, nearly three months after the private consortium unveiled its bid to the public, the BTU finally got a call from 2024 officials. The call to set up a meeting came several hours after a Reporter inquiry on Tuesday morning. Not conferring with the teachers union sooner could prove to be a significant misstep for Boston 2024. Last month, the Boston Redevelopment Authority (BRA) approved the BTU’s $23 million plan to demolish its existing building, build a new one double the size, and add a parking garage by 2017. In the face of that, the documents laying out 2024’s bid, which the private nonprofit says is still in its “proof of concept” phase, would eliminate the BTU’s property and the adjacent Bayside Office Building and replace them with new buildings for the Athletes’ Village. He added that it is too early to say if the union will or won’t change its plans for the property. “We’re intending to build, obviously,” he said. “I think it’s wildly premature for the city or anyone to talk about taking our property before the taxpayers have a chance to speak their mind next year,” a reference to talk about a statewide referendum on the Games. The question of whether or not the Boston Teachers Union and other nearby properties could co-exist with an Athletes Village on the Point was highlighted during a meeting of the Columbia-Savin Hill Civic Association on Monday night. The association, which has the name of one Martin Walsh on its roll of former presidents, has long been involved in nurturing a master plan for Morrissey Boulevard, UMass Boston, and the roads and properties on Columbia Point. John FitzGerald, a BRA employee who serves as Mayor Martin Walsh’s liaison to Boston 2024, attended the meeting, part of an ongoing tour of local civic groups for FitzGerald, who has been tasked by Walsh to seek out public comments on the Olympics. But FitzGerald has often been put on the spot and pressed to provide specifics about 2024’s proposals, and that was the case Monday night as he was peppered with questions from a handful of Savin Hill-area residents, some of whom spoke in opposition to the Olympics Village concept. During a 45-minute Q&A, FitzGerald was pressed to explain how an Olympics Village would be sited on what are now privately owned properties around the former Bayside Expo Center. In response to a question, FitzGerald indicated that some buildings – namely the Boston Teachers Union hall and the Bayside Office Center (which houses the offices of the Dorchester Reporter) – would have to be torn down for the Athletes’ Village. “The Bayside Office Center and teachers’ union hall would have to come down,” FitzGerald told the gathering. “You guys just approved an expansion for the teachers’ union,” said a member of the audience, a reference to the BRA’s okay last month of the union’s reconstruction plans last month. “Yes, I’m aware,” said FitzGerald. Another residential apartment complex planned for Mt. Vernon Street – dubbed University Place Residences— could also be impacted, FitzGerald suggested. The complex, which is being developed by Corcoran Jennison Cos., would be a 175,000-square foot, six-story building adjacent to the existing Bayside Office Center. It won BRA approval in 2013 and construction work is expected to begin in the coming months. “University Place and those things that haven’t happened, if we don’t get the bid, I’m sure those things will go forward,” FitzGerald told the Columbia-Savin Hill audience. But any talk about the removal of existing buildings – or of holding off on approved projects to make way for an Athletes Village – is not consistent with what another key landowner has been told by Boston 2024 planners. University Place: Corcoran Jennison Co. plans to build the apartment complex this year along Mt. Vernon Street.Michael Corcoran, president of Corcoran Jennison Cos., owner of the Doubletree Hotel and the Bayside Office Center, met with Boston 2024’s David Manfredi in February after a Reporter story in January outlined Corcoran’s concern that his company had not been consulted by 2024 officials prior to that time. At that meeting, Corcoran told the Reporter, Manfredi assured him that existing Corcoran Jennison properties “were compatible with what they planned” for the Athletes’ Village. Corcoran was assured that pending projects, including an expansion of the Doubletree Hotel and the construction of University Place, would not be viewed as obstacles by the 2024 committee planners. Asked to respond to FitzGerald’s comments at the Monday night meeting of the Columbia-Savin Hill Civic Association, Corcoran said he was surprised because they were in conflict with what he had been told by Boston 2024 officials. With respect to how properties might be acquired should the Olympics bid be approved, City Councillor Josh Zakim, who represents the Back Bay, has proposed four city-wide ballot questions for this fall’s ballot, one of which would gauge public support for using eminent domain to take land for the Games. In January, Mayor Walsh said he would not pursue such an option. Bill Forry contributed to this report.